Many of us have personal libraries, and within those libraries the chance that we own a standard hardcover book is high. Modern case bindings (also known as hardcovers) are everywhere. These bindings are constructed from paper boards covered by a sturdy cloth or decorated paper, and the cover is generally made separately from the text block and attached later by endpapers. 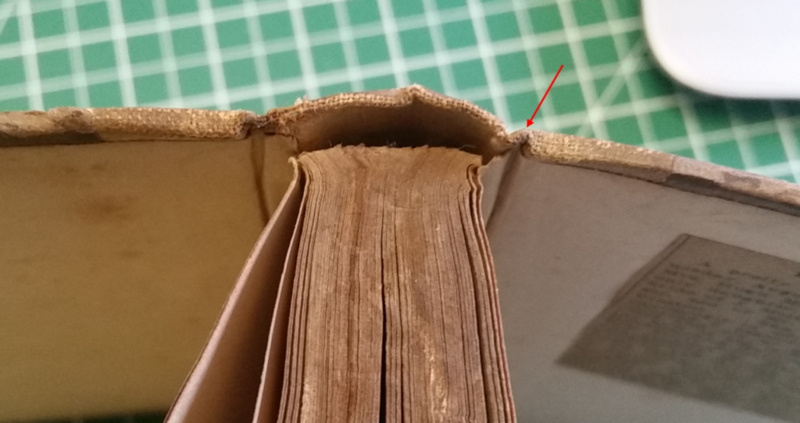 Case bindings are made the same way now as they were made in the 1800s, and so often the problems I see with older books are the same problems that will eventually happen to the new book sitting on your shelf. In fact, it even happened to a friend’s copy of a recently bought Game of Thrones book! Before the text block is out of the case you may find that the joints are loose and simply need to be tightened (I will cover this in more detail further down). The text block falls out of the case but the entire case is intact. This will require that the text block will need to be rehung in the case. If the text block has separated from the case, you could have text block problems or spine problems, and this will require re-backing the text block and possibly re-sewing. Damaged and weak corners on the board. The case is falling apart (as when the spine of the case has come away from the boards leaving the boards attached to the text block but the spine missing). The most issue common with case bindings is joint problems. If you’re able to catch it in time, a little bit of PVA glue to tighten up the joints will go a long way in preserving your books and preventing them from falling apart. Since the covers and text block are often held together only by endpapers, joint problems are the biggest issue we run into with standard hardcover books. There is little that can be done to prevent it: it’s simply going to happen eventually. Because the weight of the text block when the book is standing pulls downward on the spine and over time the end paper cannot hold it. In the photograph below you can see the looseness of the joints. This, as I mentioned before, is an easy fix. It requires taking a skinny metal rod (perhaps cut from a clothes hanger), dipping the rod in PVA glue and then sliding it into the joint where the paper is coming loose. Once you’ve applied glue to the joints that need it, from the top and bottom if necessary, you press the book for a minute or so until the PVA is dry. Once the joints are tightened you can see that the paper now fits snuggly against the boards. 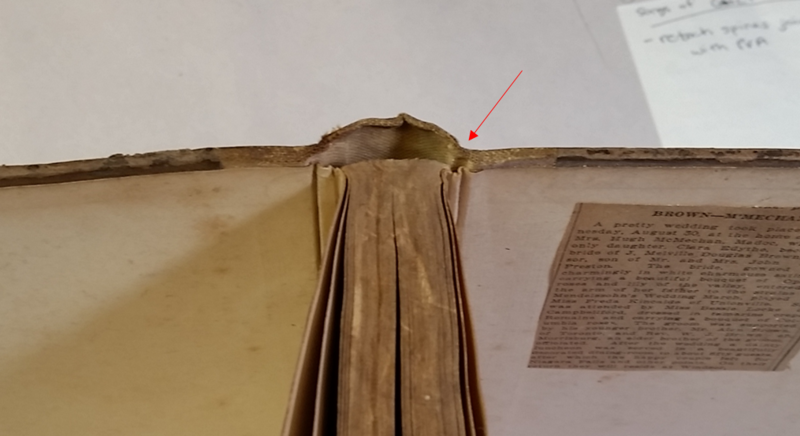 This repair is quick and easy, and will help the book last longer, as you’re catching the joint problem before the paper can tear away from the boards completely (which would leave you with a detached text block!). 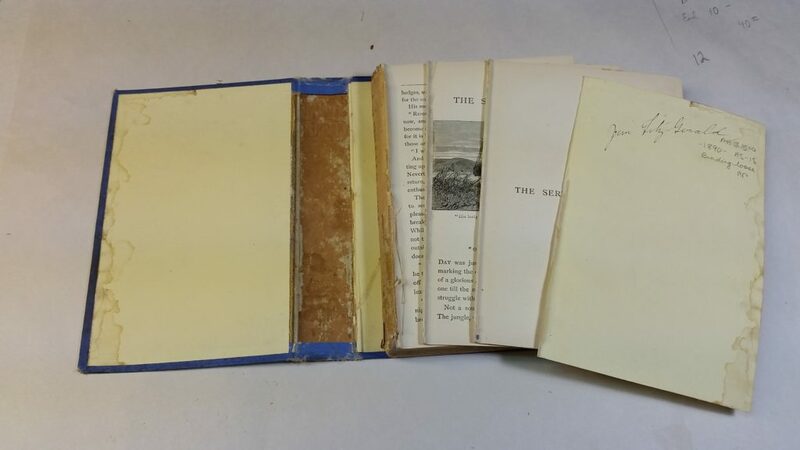 Another problem that can occur with case bindings is that if the end pages tear, the text block can come completely out of the case, or the spine of the case can tear and come completely off but the boards remain attached to the text block. Below is a photo that shows a text block detached from the case. This text block also had to be resewn. These fixes require a bit more work, from resewing the spine to re-backing and attaching a hollow tube on the text block. If your book reaches this state, consult a professional who can determine what steps are needed to repair the book. Mold can develop on any book and the risk of mold comes in areas of high humidity. If you’re worried about mold growing on your books, try to lower the humidity of the room to make the mold inactive. If you do find mold on one of your books, take it off the shelf and let the mold dry up. Small amounts of mold can be vacuumed up using the upholstery attachment of your vacuum. You can also wipe the bindings and text block edges with cheesecloth dipped in 70% alcohol and wrung out very well! A book can be easily cleaned of dirt, soot and dust by wiping it gently with a dry-cleaning sponge. You can also vacuum the book with the upholstery attachment. Start with the top of your book and wipe from the back of the book to the front, or the spine to the edge of the text block. Store books that are the similar heights together; if they are 15 inches or less in height and of medium thickness store them standing upright but if they are taller or thicker lay them on their sides. Leather-covered books shouldn’t be stored next to cloth- or paper-covered books because the leather may stain the other books. Give your books room to breathe: don’t shelve them tightly together or it may cause distortion– but keep them close enough together so that they support each other. These are just some of the things to keep in mind when working with hardcover books! Store them properly, take care of them, try to catch joint problems early on and your case binding will last a long time! Brown, Michele. Preserving Books in Your Home Library. Ithaca, NY: Cornell University Library, PDF. CBBAG: Repair & Restoration Workshop. Dan Mezza, London ON. January 2017.